Taken individually today’s Mainstreet poll is unremarkable. The Conservatives are leading the NDP by 20 points. What is amazing is how flat the polls have been for 3 full years now. Six months after the last election, the air went out the tires of the NDP and their popularity dipped to below 30 per cent and it has remained in that neighbourhood ever since. Before the merger the PCs and Wildrose combined were in the 55 per cent range. 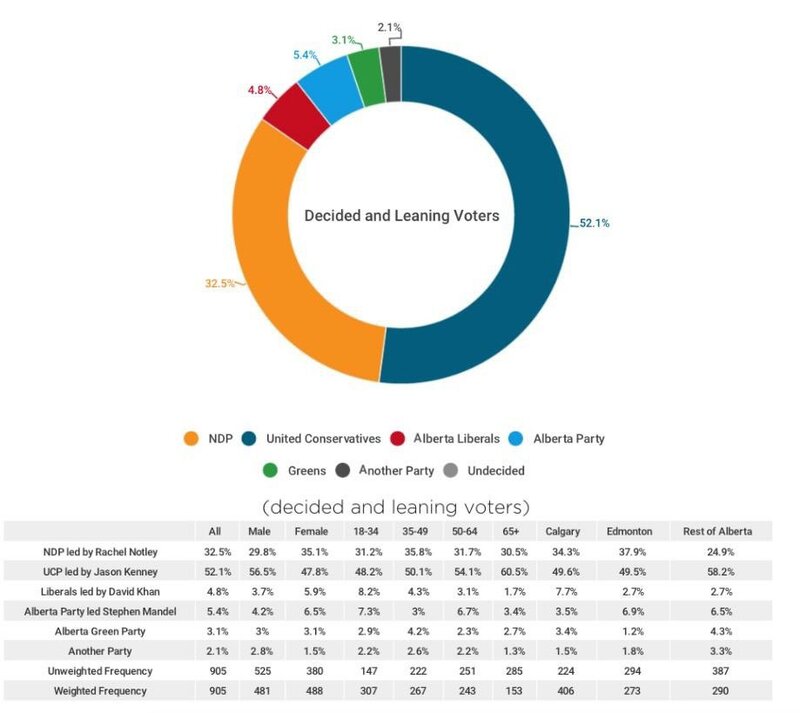 The merger was really a 2 + 2 thing as the UCP has consistently polled in the 50s. In th e “thing or not a thing” debate the Alberta Party remains not a thing. Twitter notwithstanding, the mass exodus of moderate PCs to the Alberta Party did not happen. Sure a few of my friends in the business moved to Team Stephen Mandel, but they did not bring popular support or money with them. With popularity in the single digits, they are left with the task of finding a handful of potentially winnable ridings and concentrating their resources. The name alone will doom the Alberta Liberal Party. A decade ago they were the official opposition and now are a rounding error in polling. Nothing kills Alberta Liberalism like a Prime Minister Trudeau. The NDP probably lost the next election when back in 2015 they decided to act like the NDP in British Columbia and not like the NDP in Saskatchewan. Albertans may well have accepted orange prairie populism similar to the Blakeney and Romanow governments. Instead they gave us the carbon tax, massive growth in the public sector and huge deficits. It failed. Alberta is, after all, Alberta. For we Conservatives the challenge is to not lose our current popular support. So far we have weathered the storm of anger coming from the Notley government. The anger, even if it gets worse, and it may well get worse, does not really worry me. If this negative messaging was going to work, it would have worked by now. Albertans are not buying it. However, we still have to earn votes to win. We need to show our commitment to focusing on restoring prosperity and getting the budget back to balance. Albertans want a better future and we need to speak to that. We cannot wander off message and engage in divisive debates about social issues. We are, after all, the United Conservative Party.